It’s that time of the year again, organized for the 3th time, Antwerp will hold the Biggest Fashion event of the year. Get ready for a weekend full of fashion, a late night shopping, street parties, mini-concerts, competitions, fashion shows & installations and lots of in-store event shopping, the most exclusive parties, and fun. The weekend will kick off with a huge fashionshow on friday september 4 held under central station at Club Ampere. It’s a multibrand fashionshow showing collections from Antwerp’s finest stores and some young creative designers. Guests will be welcomed with drinks and some fingerfood. After the show you can have a chat with other guests while enjoying a drink. On Saturday lots of participating stores will love to treat you very very well with lots of instore-events and some very special AFF deals during the entire weekend when showing your AFF magazine(can be found in the shops). Monar & Clothes invited Steve Locatelli a street artist who’ll team up with street brand New Balance , so get ready to be blown away with some cool and live street art during this New Balance x Steve Locatelli event. 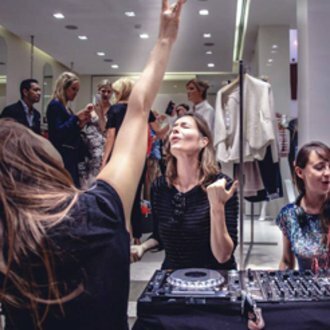 At the Armani Jeans store ( on the Meir) you can enjoy a Dj set , have some cocktails and take the most fashionable selfies in a special sharing box machine. How cool is that !!? You can enjoy lot’s of discounts during the late night shopping, go crazy and get 20% discount from 17h till 22h at COS, get 10% at Valentino. Luxury denim brand 7 for All Mankind will open their new ,bigger and improved premium denim store !!! Feel free to join me and my friends for some dancing on funky beats with models while enjoying some delicious drinks and food ! Can’t get enough ? Well the night is still young and join us at the Official AFF afterparty at club Magic! (Rsvp only !!) Not on the list? Well no worries, you can still party all night long at the AFF Unofficial Afterparty at club Ampere. (tickets and entrance at www.ampere-antwerp.com). On Sunday you can shop shop till you drop because all stores will be open that day, discover and get ready to fall in love with all those “ coup de foudres “at the “ Fashion Village”. Afterwards you can sit down and relax some good movies during the AFF Film Night at Cartoon’s Cinema(Kaasstraat 4 – 6). The Fashion Film Night will show a selection of fashion short filmsThese films fuse the art of filmmaking and fashion design. The selection features inspiring and creative fashion films by new generation of film makers and artists from all over the world. More than enough reasons for NOT missing this exclusive event !! but HURRY HURRY , tickets are almost gone !! BE THERE OR BE …. NOT FASHIONABLE AT ALL !! Posted in EVENTS, HOME and tagged antwerp, antwerpfashionfestival, blogger, Fashion, fashioncity, fashionshow, igers, mensstyle, september, weekend. Bookmark the permalink.